Alex and Meredith scope things out when they arrive at the hospital after spending the morning reflecting somewhere at a pier. What were they talking about together? Were they thinking about how far they have come and how much everything has changed? 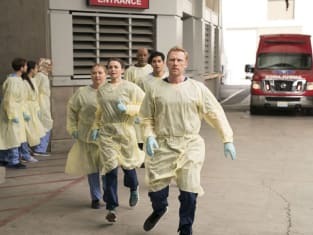 Grey's Anatomy Season 14 Episode 7: "Who Lives, Who Dies, Who Tells Your Story"
ABC Sets Midseason Schedule: What's on the Move? 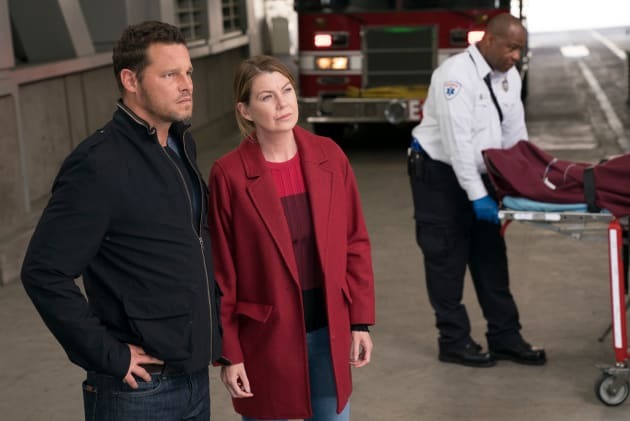 Grey's Anatomy Review: Congratulations, Meredith! Greg: The guy I remind you of. Meredith: His name was George. He was a hero. Permalink: His name was George. He was a hero. Alex: Baby O'Malley and baby Yang. Meredith: And there is a baby Izzie having a baby. Permalink: And there is a baby Izzie having a baby. Grey's Anatomy Round Table: M.A.G.I.C. Nostalgia!